Veg Pulao Recipe is delicious medley of rice, spices and vegetables. Also known as Veg Pulav, Indian Pulao or Vegetable Pulao, this North Indian dish is very simple and easy to make and pairs perfectly with any raita or curry of your choice and is very tasty. Here is how to make Veg Pulao or Vegetable Pulao. Pulao is a fragrant Indian style rice dish where rice is cooked with spices and vegetables. In Indian, they make a variety of Pulao like Matar Pulao, Tawa Pulao, Badi Pulao, Veg Pulao etc. There are sweet versions of pulao as well like Bengali Mishti Pulao and Zafrani Pulao. Pulao can be eaten as is or is best served with raita and pickle. A piece of papad on the side works like a charm. There are often days when we are looking for simple, one pot comfort food that’s quick to make and good to eat. For me, this Veg Pulao fits the bill perfectly on such days. You can also make this on occasions when you have guests over. To cook this recipe, you just need a few minutes. Rice, onion, spices and a sprinkling of fresh green coriander makes this dish irresistible. The whole spices used in this pulao lend it an aromatic and distinct flavor. The use of an array of vegetables make it reasonably healthy. This Veg Pulao can be paired with any raita of your choice. Vegetable pulao is also a good way to sneak some vegetables in your little ones diet. 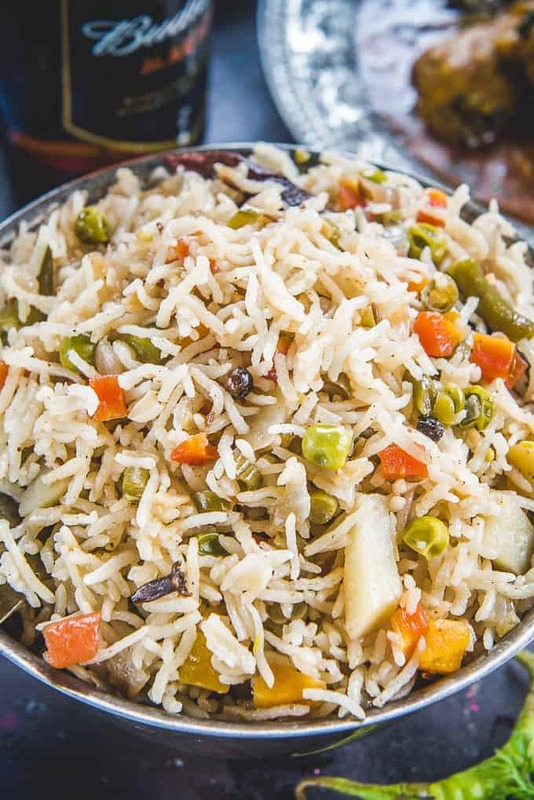 You can make this pulao recipe in a pressure cooker as well to save on time. If you have already tried Andhra, Bengali and Kashmiri Style Veg Pulao, this White North Indian Restaurant Style Veg Pulao recipe must be in your list to try out. So, what are we waiting for? Let’s quickly get to the recipe! What is the difference between Biryani and Pulao? 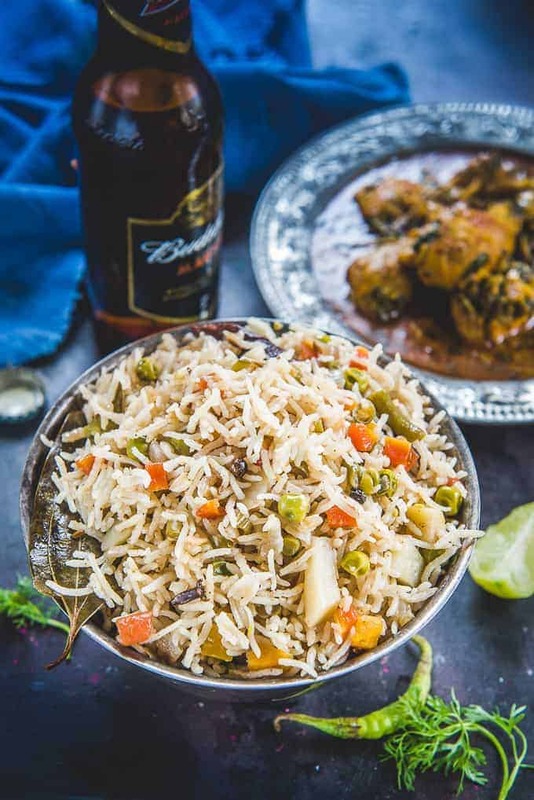 Pulao is a medley of rice with either vegetables or meat and both these things are cooked together with subtle spices whereas in Biryani, rice and meat or vegetables are cooked separately and then assembled in layers. It is much richer due to use of ghee and fried onions and more spices. Use long grain Basmati rice to make this pulao. The grains will remain separate and the fragrance will be amazing. You can choose the vegetables that you want to add in the pulao. You can also add corn kernels or baby corn, broccoli, capsicum etc. After the pulao is cooked, let it rest for at least 5 minutes before fluffing it with a fork. It will make sure the grains do not break while fluffing it. Ghee adds a very delicious flavour to the rice however if you want, you can use olive oil too. But adding some fat helps to keep the grains separate so do not skip it. You can also add bari or lentil dumplings to this pulao. Just break the bari into small pieces and fry until browned. Then add them in the pulao along with the vegetables. Slightly crushing the whole spices before adding them in ghee will make the flavour stand out even more. Add some roasted Kasuri Methi along with the vegetables for a even more delicious flavour of this pulao. I sometime cook this pulao in veg stock instead of water and it takes the taste to a whole new level. You can try using soup cubes that are easily available. Also try to cook this pulao in thin coconut milk. It has a very different and very delicious taste. I have a lovely recipe in which Veg Pulao is cooked in some curd. Do not forget to check it out. Here is how to make Dahi Wala Pulao. To make a variation of this veg pulao, you can add a paste made using coriander, mint and green chilies. It will impart of a very different flavour to the pulao. You can also add masala powders like Goda Masala, Sambar Masala or Vangi Bath Masala to this recipe for a change in taste. 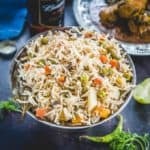 How to make Vegetable Pulao in Pressure Cooker? To make veg pulao in a pressure cooker, follow the same method. Pressure cook the rice for one whistle on high heat and then switch off the flame. Let the pressure release on it’s own. Open the cooker and then fluff the rice gently. How to make Veg Pulao In Microwave? To make veg pulao in a microwave, heat ghee for one minute in a microwave safe bowl. Add cumins and whole spices and micro on high for 30 seconds. Add onion, ginger, garlic and green chillies and micro on high for 3 minutes. Now add the veggies and micro for 2 minutes. Add the rice with water and salt and micro for 10 minutes. Remove the bowl from microwave and let the rice rest for 5 minutes before fluffing it. What goes well with Veg Pulao? You can pair Veg Pulao with any raita or curry of your choice. I like to eat it with just pickle and papad too. To make Veg Pulao, you will need a pan with a tight fitting lid. Wash the rice and soak it in enough water for 30 minutes. Heat ghee in a pan. Once the ghee is hot, add whole spices and let them crackle for a few seconds. Add onion and fry until they turn slightly brown. Now add ginger, garlic and green chilli and fry for a minute. Add carrot, beans, cauliflower, peas and potato and cook for a minute. Drain the rice and add it in the pan. Add 3 cups of water, salt and lemon juice and cover and cook on low heat until all the water is absorbed and the rice is cooked. Veg Pulao Recipe is delicious medley of rice and vegetables. It is very simple and easy to make and pairs perfectly with any raita of your choice. Wash the rice and soak it in enough water for 30 minutes. Once the ghee is hot, add cumin seeds, cloves, cinnamon, black cardamom, green cardamom, peppercorns and bay leaf and let them crackle for a few seconds. Add ginger, garlic and green chilli and fry for a minute. Now add carrot, beans, cauliflower, peas and potato and cook for a minute. Add 2 cups of water, salt, garam masala powder and lemon juice and cover and cook on low heat until all the water is absorbed and the rice is cooked. We will try it today..
Thnx and happy new year to you too.